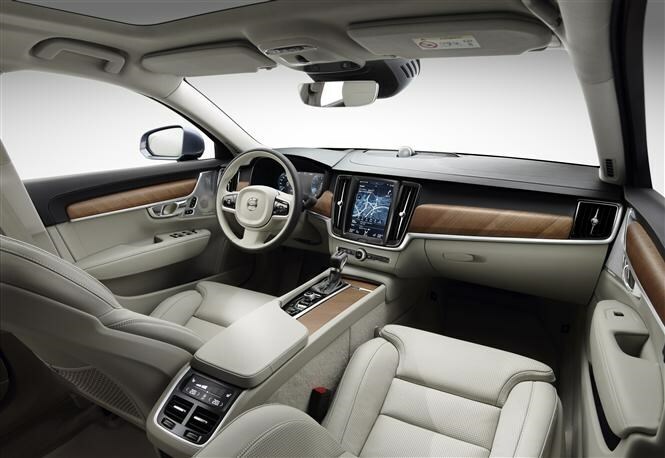 It won’t reach British showrooms until summer 2016 but the Volvo S90, the Swedish company’s latest flagship saloon, has been unveiled to herald the brand’s march upmarket. Replacing the unfancied Volvo S80, the S90 resurrects a name briefly used in the late 1990s for the facelifted 960 saloon. Conveniently, the numeric suffix also signals that it’s a larger car than its predecessor – at 4,963mm it’s the longest car in its class. This latest S90’s no makeover – it’s a completely new design based upon the same modular underpinnings as the Volvo XC90. Joining the S90 later in 2016 is the V90 – a spacious estate counterpart – which will replace the V70 in the firm’s line-up. 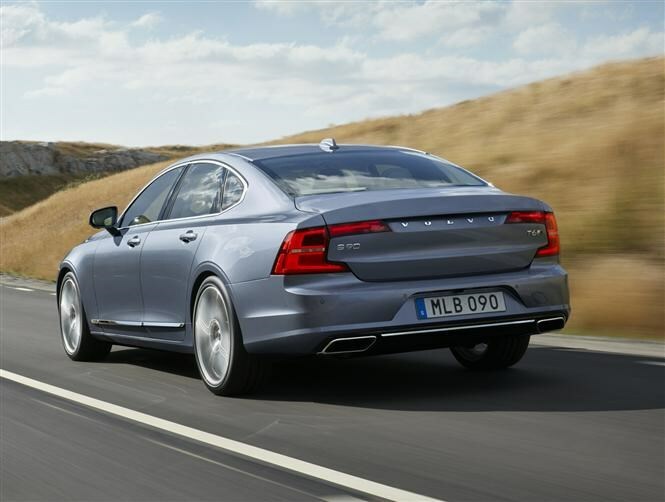 Volvo’s aiming high with the S90 - citing the Audi A6, BMW 5 Series, Jaguar XF and Mercedes-Benz E-Class as its direct rivals. It’s not just the flexible platform that the Volvo S90 shares with the XC90; there’s a common styling theme, too. Athleticism isn’t an adjective you’d associate with the S80, which demonstrates just how far the S90 moves Volvo’s game along. Gone are the deep side scallops and bold shoulder-line troughs, replaced by subtler forms, with more defined edges - Volvo refers to it as Nordic elegance. By pushing the front wheels 150mm further forward than the S80’s and the passenger compartment 250mm rearwards, Volvo claims to have delivered proportions customers associate with upmarket cars. The windscreen’s been reclined further back, leading to a much shallower side-window depth than we’re accustomed to from Volvo saloons. It’s not quite into four-door coupe territory but the result remains rakish. Volvo’s new signature ‘Thor’s Hammer’ day running lights feature up front, while at the back enormous C-shaped tail lamps continue into the bootlid. In a break with the company’s saloon tradition, the rear number plate has been relocated to the bumper. Brand aficionados will also spot the concave-barred grille, reminiscent of the firm’s iconic P1800 coupe from 1961. Inside the continuing similarities with the XC90 are obvious, with a dashboard dominated by a large infotainment touchscreen in a cabin otherwise blighted by few buttons. First impressions are that material quality feels at least on par with the S90’s cited rivals. In line with the company’s engine downsizing drive, all powerplants are of a 2-litre, four-cylinder capacity. Sales of the T6 petrol aren’t expected to be particularly high but for S90 customers who rarely cover large distances the 316bhp motor could be the one to have. Just be aware it’s the least efficient of the range with claims of 38mpg and 169g/km of CO2. Much more popular in Britain will be the D4 (187bhp) and D5 (232bhp) diesel pairing. Despite the D5 offering superior performance – 7.3 seconds 0-62mph, compared with 8.2 seconds – we expect the D4’s greater efficiency to win it more sales; 68mpg and 109g/km compared with the D5’s 55mpg and 133g/km. Most expensive to buy but least costly to run is the T8 plug-in hybrid, which has the potential to fit the bill for company car drivers, as well as those who commute primarily in urban environments. Producing 401bhp overall, Volvo claims an average of 148mpg with CO2 emissions of just 44g/km, with a potential electric range of 31 miles. Volvo insiders hint that a three-cylinder 1.5-litre petrol could join the range later, along with fully-electric and Polestar performance derivatives. 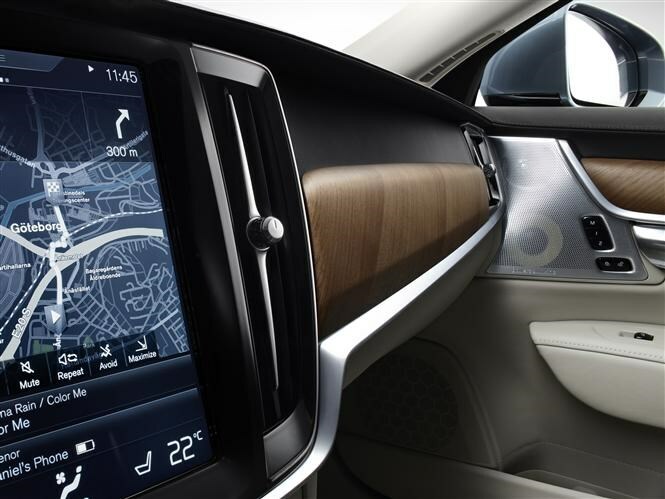 Supplementing the Volvo S90's portrait-format infotainment touchscreen, a suite of other technological developments can also be specified. Autopilot is one step away from autonomous driving and will accelerate and brake depending upon prevailing traffic conditions and road topography data. All the driver has to do is steer. 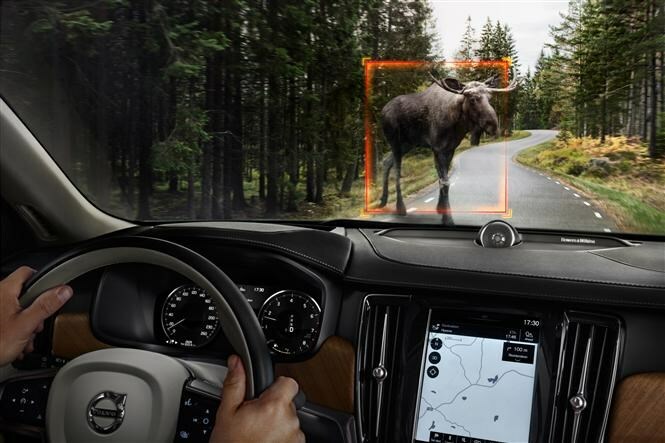 There’s a less obvious need for the large animal detection system in Britain than in Sweden where elk are common, but the package’s autonomous braking will mitigate the chances of collisions with deer and horses. 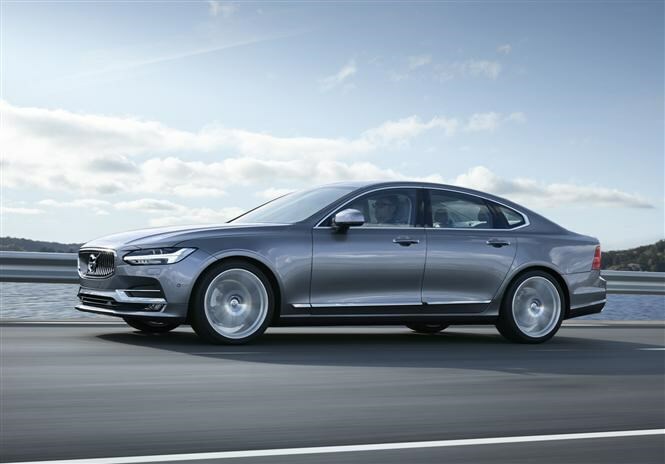 Refreshingly, Volvo’s tuned the S90 for comfort, with a double-wishbone front suspension arrangement and a modern take on the transverse leaf spring fabricated from composite materials at the rear. Engineers have been keen to deliver a ‘Volvo feel’ and scoff at the notion of setting fast Nurburgring lap times in an executive car designed for cruising. Volvo has yet to reveal prices for its all-new S90 but expect them to be higher than the outgoing S80 when the car’s available to order in the middle of 2016. We’ll be putting this distinctive executive saloon to the test next year when we discover if the all-new Volvo S90 will shake up the established order.